The statistics are alarming: Nearly one in three adolescents ages 13 to 18 now meets the criteria for an anxiety disorder, according to the Centers for Disease Control and Prevention, and 32 percent of teens report persistent feelings of sadness or helplessness. 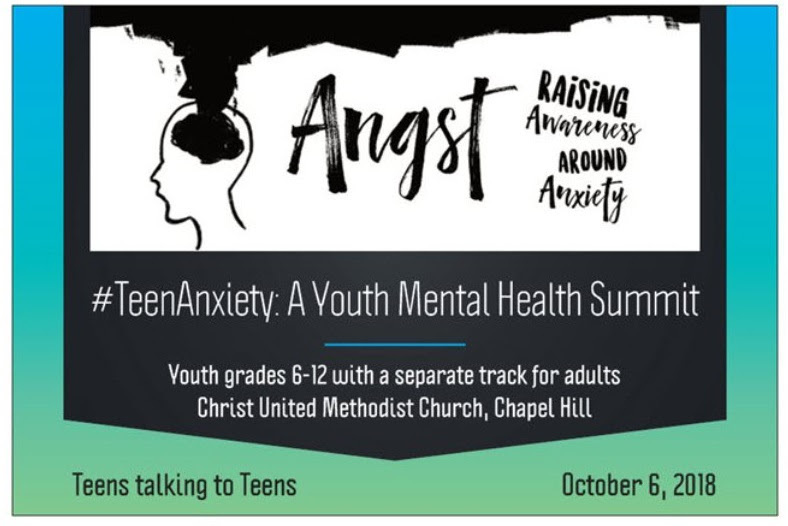 To help to give teenagers skills to navigate their mental health journeys and to offer adults tools for helping, two Triangle advocacy groups are sponsoring #TeenAnxiety: A Youth Mental Health Summit at Christ United Methodist Church, 800 Market Street, Chapel Hill, NC 27516, on Saturday, October 6, 8:00 a.m. – 4:00 p.m. Stand by Me NC and Faith Connections on Mental Illness have joined to present the event for youths in grades sixth through 12th with a separate track for adults. Registration is limited to 100 teens and 40 adults. A $25 registration fee includes all programming, lunch and a T-shirt. Scholarships are available. Registration is limited to 100 youth and 40 adults. There are two different registration sites. Click here to register youths. Click here to register adults. For more information, please visit www.standbymenc.org. If you have questions, please email youthmentalhealthsummit@gmail.com.